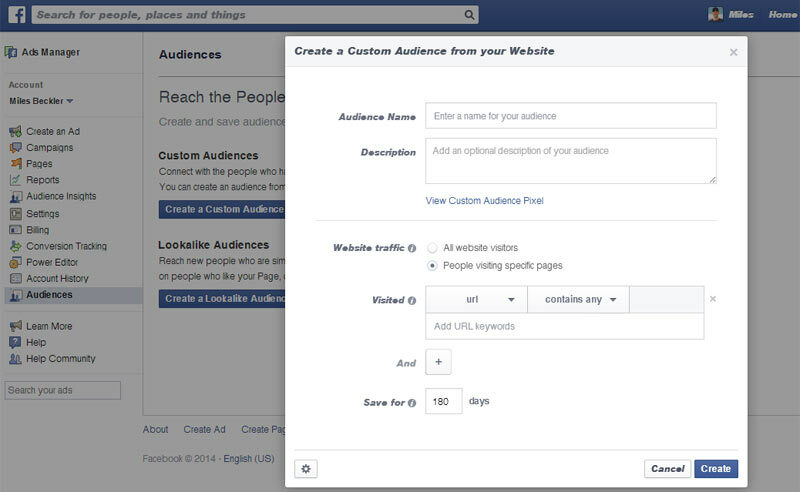 Not only are Facebook ads hot right now, but re-targeting is also very popular. Why? Because it's effective! 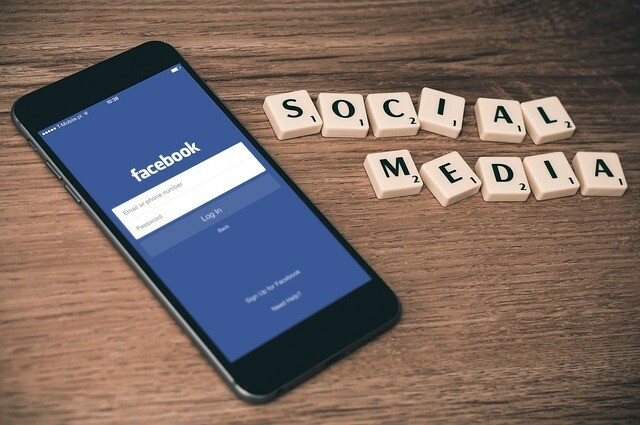 If you are not retargeting your visitors on the world's largest social media network, simply stated... You are missing out on sales and revenue! 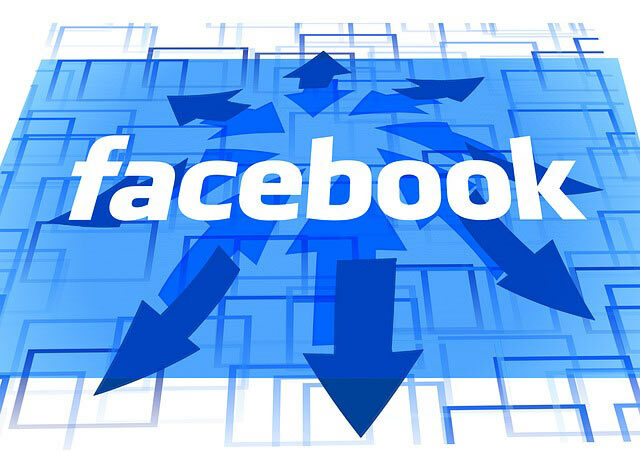 This post is not only going to look at what Facebook re-targeting is, but it will also give you a quick and easy understanding about how to start re-targeting your leads and visitors on Facebook to increase sales. To understand re-targeting ads, lets look at them two ways. First, in a way you've probably experienced before, which is from the user's perspective. You leave your laptop to get the door and grub-down. Then, after eating too many pieces of pizza you decided to go onto Facebook because you are addicted to Facebook. Now, you see an ad for that awesome set of knives from that last site you were on and deep down, you really want them. Instead of browsing around more looking for a better deal on Amazon, you click through the ad and you buy them because you wanted even more instant gratification than the pizza provided. You set up tracking code on your site that 'cookies' a visitor when they reach your website. A cookie is simply a few lines of code that Facebook gives you which 'tags' a visitor via a 'tracking pixel' when they reach your site and that 'tag' stays in their browser until they clear all of their browser's stored data (which most people never do). Ok, I got way-techie right there... Back to our story! So, the visitor was looking at your super-duper knife set in your webstore and they didn't buy... But, the next time they go to Facebook... BAM! Your ad for that exact product shows up, reminding them of how much they want that knife set and you could even offer a promo code for 10% off or free shipping to seal the deal! The deal is too good and the process is too easy for them. They click through and buy! This campaign just generated another sale you very-well may have lost had it not been for Facebook re-targeting. The short version of 'Why' you should be doing retargeting is because when done right, it can increase your revenue and make you more money. Enough theory! Lets get into some nuts-and-bolts, here. How do you do re-targeting on Facebook? Let me break it down for you in seven easy steps. 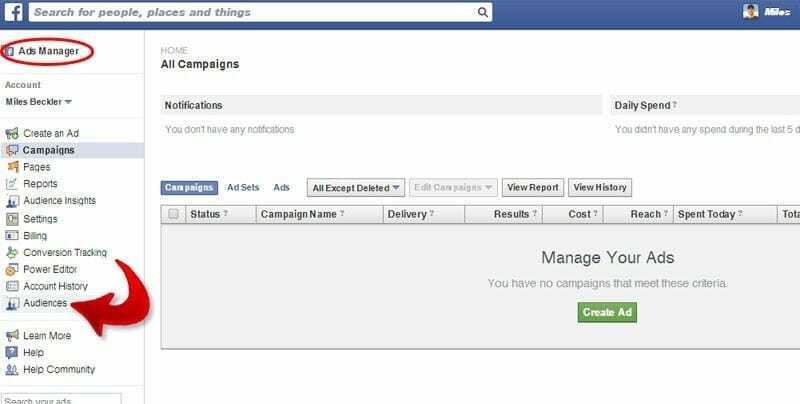 Step 1 - Click on the "Ads Manager" link on the left navigation after you are logged into Facebook... It is directly below your profile picture and the 'Edit Profile' option. Step 5 - Copy the snippet of code and place it between the <head> and </head> tags on the pages you want to track users from. Not really into code and have someone who manges that for you? 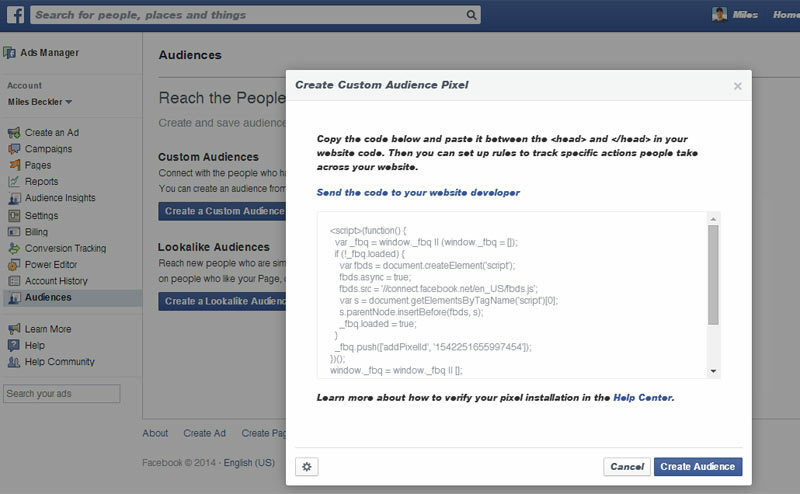 Great, Facebook actually has an option that will allow you to send that snippet to your developer, right there! Step 7 - Once you have tested your code (by visiting the page after the code was installed) you will be able to once again go to Ads Manager, click on the Audiences button and you will see the audience you setup. In the far right column with the heading 'Advertise' you will see a 'Create Ad' option that will allow you to create an ad that will only show to this particular audience. 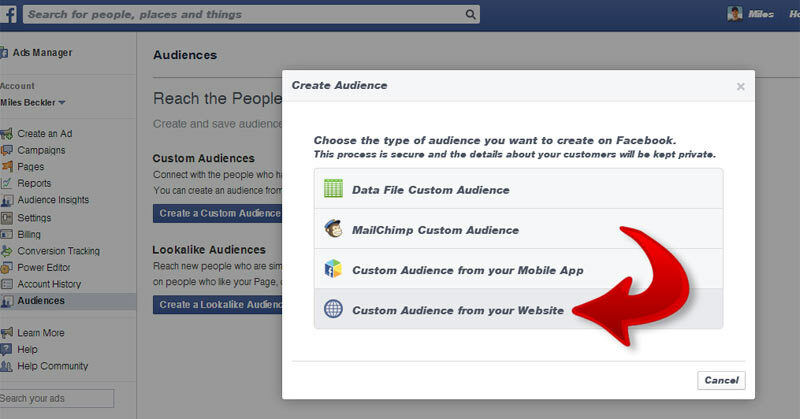 If you don't see the 'Create Ad' option right away, know that you may need to have 100 visitors or more reach your site who are also Facebook users before that option comes available. 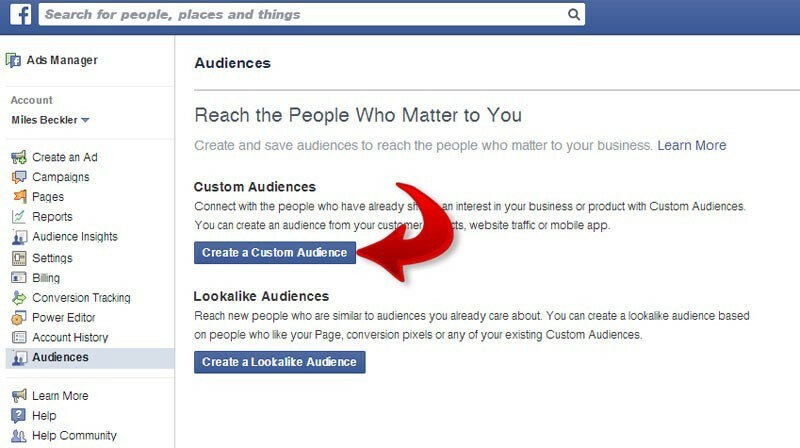 Essentially, Facebook needs a certain amount of data regarding 'who' the ad is targeted to before you can create the ad. All-in-all, that is it... A very simple process that any business owner or website owner can and should implement. Even if you aren't ready to run a re-targeting campaign right now, you might be in 60 days, or possibly on Black Friday and Cyber Monday, so get your tracking code in place and let Facebook start identifying which of their users are visiting your site, so when the time comes, you can create a compelling ad that will bring all those visitors and sales you lost back to your site for another chance at closing the sale!